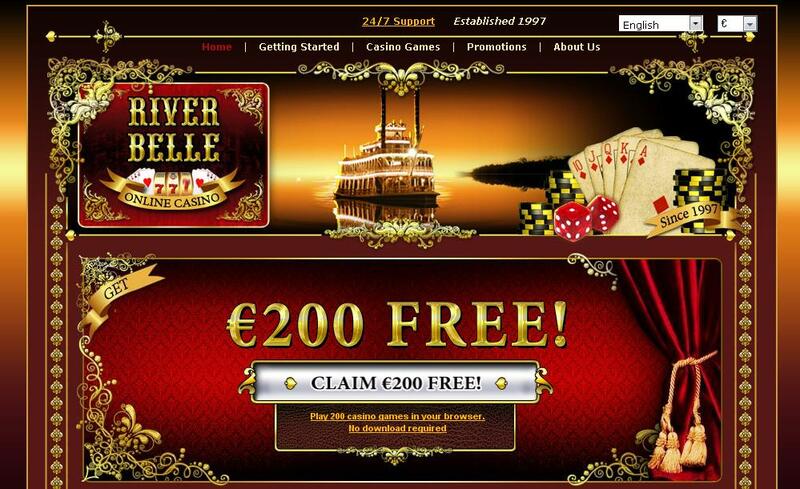 One of the oldest existing online casinos is the River Belle Casino. River Belle Casino is taking in wagers from numerous satisfied customers from as early as 1997. It is owned as well as operated by the Belle Rock Entertainment, a subsidiary of the Carmen Media Group. River Belle Casino has acquired license from the government of Gibraltar. This online casino welcomes players speaking German, French, Spanish or Japanese, apart from English. The games available can be dealt in U.S. and Canadian dollars, Euros as well as British pounds. River Belle Casino has brought back the memories of the old world and charm associated with Mississippi river boat along with one of the best bonuses and terrific customer support. 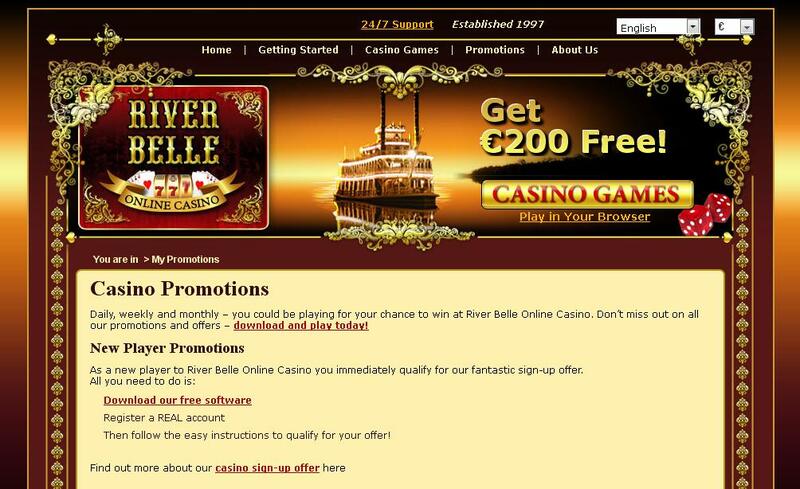 River Belle Casino has a good sign up bonus on offer for all the new members. New players who join may claim a full 100% Match Bonus till about $100 on the first deposit. One has to just open an account, make a deposit of $100 in a single transaction, and then request for the bonus. Roughly in about 24 to 72 hours, the bonus amount will be deposited in the respective players’ accounts. River Belle makes use of the much acclaimed Microgaming’s Viper software, which provides one of the highest standards of gaming experiences. Games are quite fast and have got a good feel. The software is quick to download and has normal system requirements, like Windows 95, or 16 MB Ram, sound card, modem etc. The software, subsequent to download offers 250 interactive games, and have flexible change game options as well as full interactivity. River Belle provides quite an extensive range of banking alternatives that bring in great flexibility to the online casino. Deposits may be made through the use of eCheck, FirePay, NETeller, Click2Pay, NETeller, InstaCash, credit cards like Diners Club, Master or Visa card, Money Transfer, Citadel, InstaDebit, PaySpark, Delta Cards, etc. Withdrawals can be made available to eCheck, FirePay, NETeller, InstaDebit, Click2Pay etc. Players may also access their entire transactional history here. The variety of games available in River Belle Casino is remarkable. There are more than 200 individual casino games available for the different players. Most of the casino favorites are to be found in addition to a few exclusive ones. Progressive Jackpot games are 19 in number, ideal for the Jackpot junkies. Jackpots worth more than $100,000 can be won, in addition to more than 100 Slot Machine games. Some good table games are also on offer with seven forms of Roulette, Blackjack, Baccarat, Keno, Craps as well as several Video Poker games. More recently, River Belle has launched a fully-equipped Poker room to help players participate in online poker against actual players. The customer care team of the River Belle Casino may be contacted round the clock in a variety of ways. Toll free phone numbers are available for customers in U.S.A, UK, Canada and many other international customers. There is also the option of live chat or e-mail, and quick responses can be expected from the polite, well trained and friendly customer support staff.